Andrews Chapel United Methodist Church is located in the rural community of Roscoe, in Coweta County. The church was organized in 1840 in a one room building just south of the present site. The present church is the second one, constructed in 1912. The church was named for Bishop James O. Andrew, whose parents lived nearby. Rev. Andrew is a prominent figure in Methodist history and deserves a few words here. He was elected a Bishop by the 1832 Methodist General Conference, and he moved from Augusta to Newton County to be near what is now Emory College at Oxford, where he was the first chairman of the Emory Board of Trustees. Rev. Andrew never bought or sold a slave but through the bequest of a Mrs. Powers of Augusta, a twelve year old girl named Kitty became his property. According to the terms of Mrs. Powers will, at age nineteen, Kitty was to be freed and given the option of going to an African colony established for freed slaves in Liberia. When the time came, Kitty wanted to stay with the Andrews. If Andrew freed her, by law she would have to leave Georgia. He then built her a cabin close to his home where she could come and go as freely as possible. 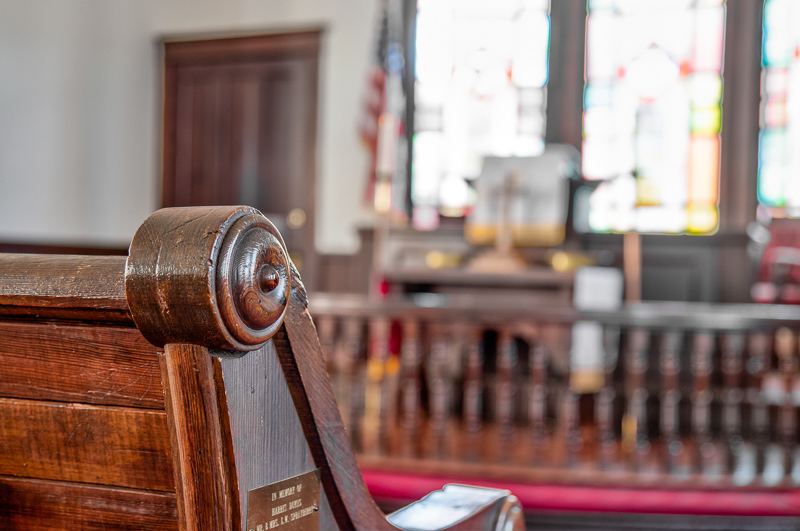 In 1844, Andrew traveled to New York for the annual general conference of the Methodist Episcopal Church and had little idea that his ward, Kitty, would become the focal point of a conflict that would split the Methodist church for almost 100 years. Slavery was becoming a major issue within the church, and some northern delegates maintained that a bishop “connected with slavery” was unacceptable. Andrew’s defenders argued that Andrew was an “unwilling” slave owner and therefore not culpable. Eventually, 136 delegates voted for a plan of separation, and fifteen voted against it. 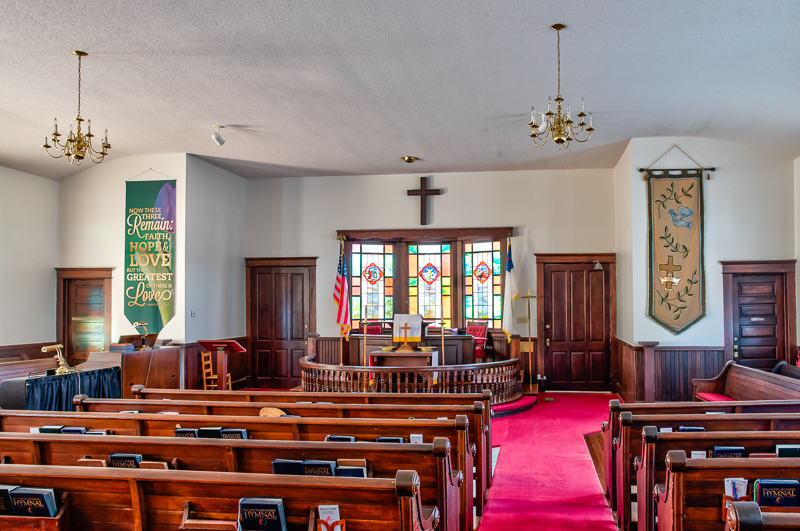 From that point on the church split into Methodist Episcopal South and North, which existed until 1939 when the two factions were reunited as the United Methodist Church. The cottage where Kitty lived is now located on the church grounds at Emory College at Oxford. The interior of the church is a handcrafted jewel and is stewarded by an active congregation. We encourage you to check out the church interior and a few of the cemetery residents in the photos below. 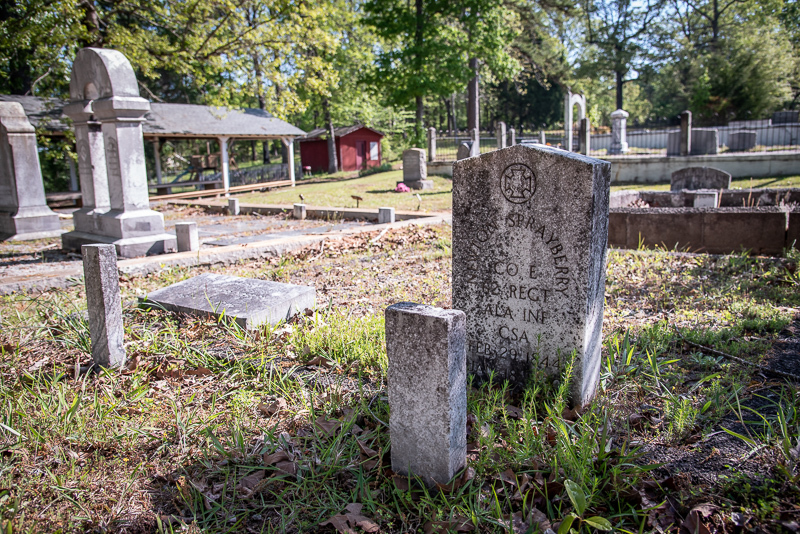 The cemetery is impressive and contains Confederate and WW1 veterans as well as many prominent early settlers of Coweta County, founded in 1826. 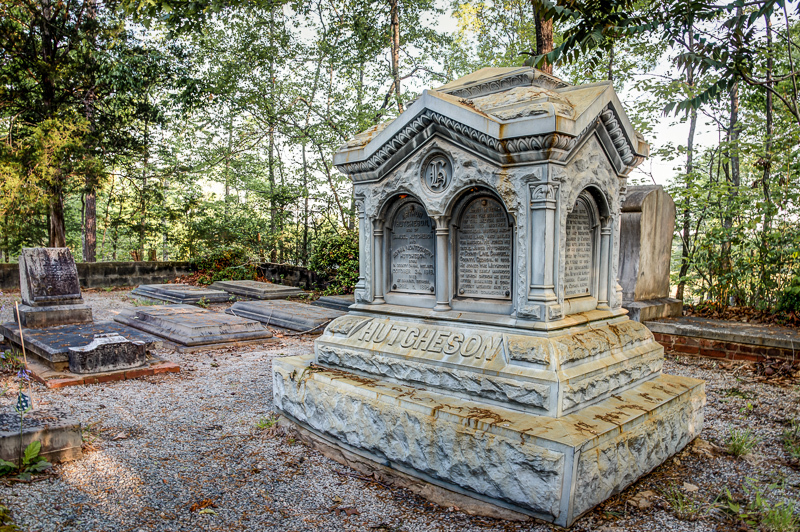 One of these prominent citizens was Arthur Hutcheson (1818-1895), who reposes beneath one of the finest and most unusual headstones we have seen in Georgia. 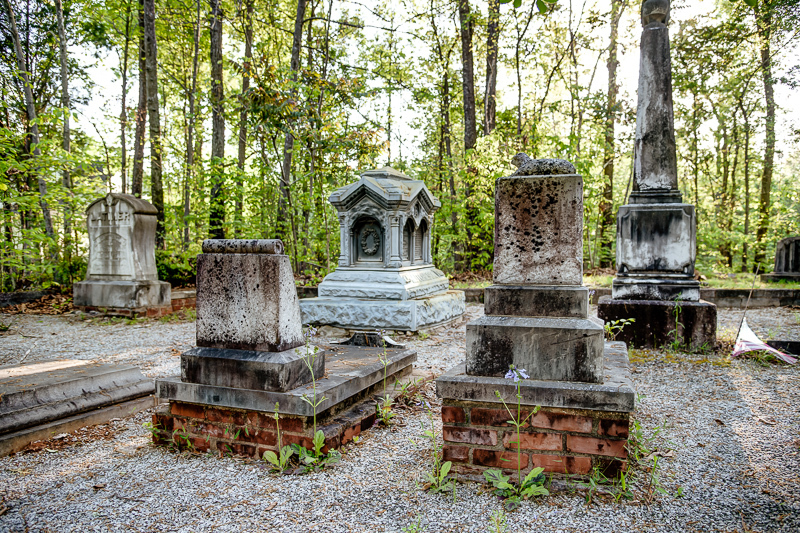 A 2000 survey of the cemetery, commissioned by the church, revealed an additional 130 unmarked graves. Sadly, fifty percent of these were identified as children. 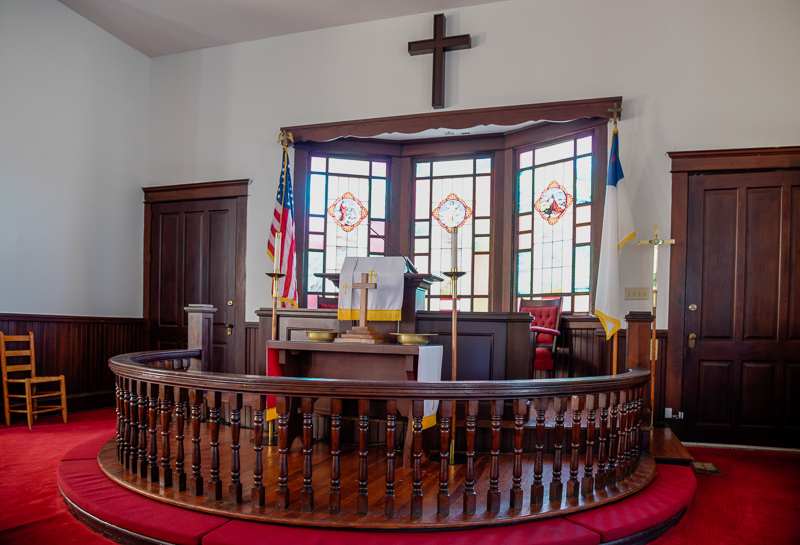 For more information on Andrews Chapel Methodist, click here. This is a lovely, 106 year old sanctuary that has seen few modifications during all those decades. This view is from the rear of the church toward the chancel, pulpit and apse. Andrews Chapel incorporates many design and decorative features we often find in turn of the century churches. One feature in particular, the large entry doors that flank the chancel, is worth noting. Congregants leave the vestibule and enter the church through those doors. You better arrive on time because, late arrivals will surely be noticed by the preacher and congregation… no slipping into a back pew! This is a close up of the chancel and the semi-circular altar rail with its lovely turned balustrade, communion table, pulpit and “bay window” apse illuminated by three stained glass windows. Flanking these are the two massive, original wood framed doors. The fit and finish of this area becomes clearly evident in this shot. In this view from the pulpit, the authenticity of this sanctuary in every way becomes clear. 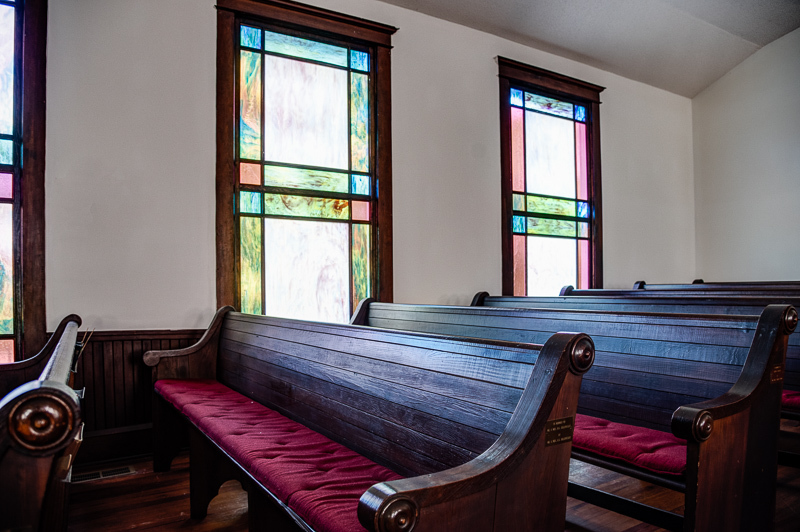 The original pews sit on the heart pine floors just as they always have. Its design and decorative elements are very modest and reflect the tenets of the denomination. Ambient light flows into the space through its large wood framed, stained glass windows. Its suspended truss ceiling slightly slants up from the walls, creating an airy space conducive to worship. Here we see the fine, detailed work on the scrolled end arms of each pew. These pews are original and quite unique. We are told that each congregant family made its own pew! How this was accomplished is a mystery to us. But in doing so, each family was guaranteed to remain interested and invested in Andrews Chapel for generations to come. 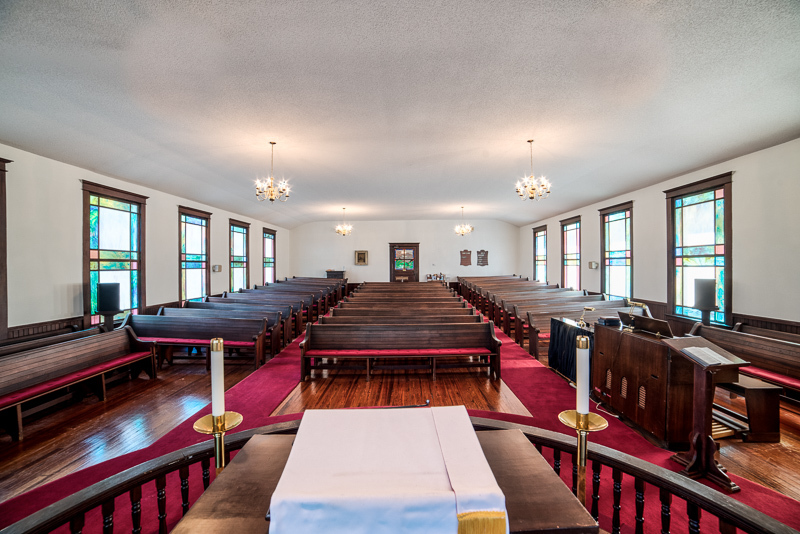 This view presents several rows of the Andrews Chapel pews. It also provides us a more detailed look at the sanctuary interior. Note the handsome wainscot, the stained glass windows in their wooden frames and how the suspended truss architecture provides a rising, vaulted, cathedral-like ceiling. 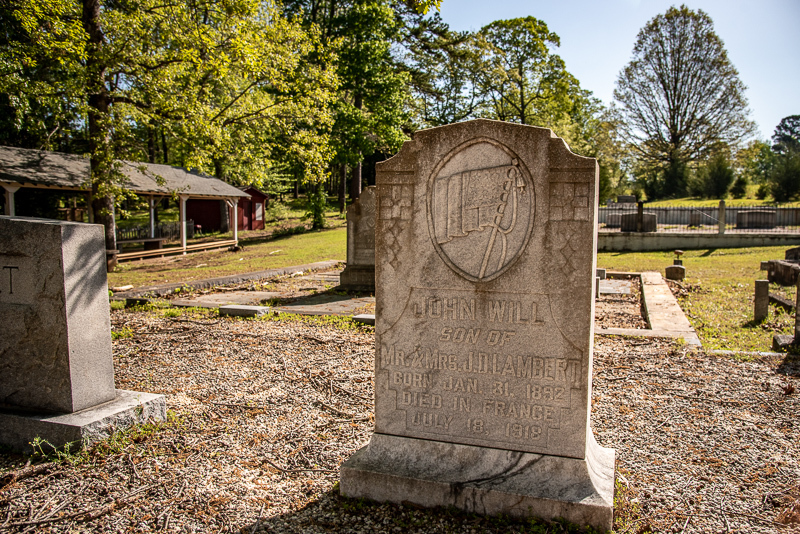 There are 27 interments connected with the name Sprayberry. If that name sounds familiar to many of you, it is because Sprayberry’s BBQ is one of the oldest and most well-known of the many BBQ establishments in Georgia. Here lies Newton Sprayberry (1844 - 1885) who served in the 62nd Ala. Inf. He was the son of Rev. Uriah Sprayberry, a Methodist minister born in England, and Ellen McKilley Sprayberry, born in Ireland. John’s much older brother, John Wesley, also served with the 30th Ga and the 31st Ala. Ellen would have been 20 years old at the birth of John and 38 at the birth of Newton. Newton, listed as a blacksmith and a farmer on his death certificate, died at the age of 75. There are not many graves in Georgia of WW1 vets killed in action, and this is one of them. As the US rapidly mobilized in the later stages of the war, John W. Lambert was ordered to report for duty on September 8, 1917. After a brief period of training at Camp Gordon in Augusta and then Camp Wheeler in Macon, he was transferred to Camp Hill, Virginia and assigned to the 2nd Division. Private Lambert was then sent to the front lines in France in May of 2018 as part of Company K, 23rd Infantry. The 23rd participated in bitter fighting in the Aisne-Marne Offensive in June and July, and there are conflicting records of the circumstances of his death. One says he died of shrapnel wounds and another reports he was gassed and died in a French hospital where he was buried in a local cemetery. His body was then re-interred and sent home to Andrews Chapel, where he was buried in “impressive funeral services” conducted on Jan. 9, 1921. We need to remember the sacrifice of so many young men in such a short period of time. The AEF (American Expeditionary Forces) sustained over 50,000 killed in action and over 60,000 noncombat deaths. Not many of them got to come home. Private Lambert rests in the cemetery among nine other Lambert interments. We are grateful for your service. There are thirteen Hutchesons in the family plot you see before you. The patriarch of the family was James Hutcheson who was born in 1793 in County Cavan, Ireland and migrated to New York in 1818. He arrived in Georgia around 1820, and married Sarah Pickens Henry in 1929. He and Sarah had six children, three boys and three girls. All three boys fought in the Civil War. The oldest was William, who joined the conflict in 1861, fighting in many of the major battles. He rose to the rank of Captain and was wounded in the leg at the Battle of Jonesboro on Aug. 31st, 1864. They amputated his leg but it was unsuccessful and he died in a hospital in Barnesville on Nov. 23rd, almost three months later at the age of 27. His younger brother, Joseph, also joined the conflict early and was taken prisoner at the Battle of Atlanta. The impressive obelisk you see in the background is dedicated to the third brother, Arthur Hutcheson, Jr. He was born in 1844 and entered the war late because of his age. He died in Chatham County in 1864 at the age of eighteen. We are not sure why Arthur Jr. was designated as a Jr. since he was the son of James. Finally, the magnificent memorial you see in the background is a tribute to Arthur Hutcheson who died in 1895 as one of the wealthiest men in this part of Georgia. More on Arthur and his memorial in the next photo. From a distance, this elaborate, impressive and striking Burial Monument appears to be made of granite. Upon closer inspection, we discovered that is not the work of a stone mason or granite sculptor who inhabited this area in the late 19th century. In fact, it is a remarkable example of the zinc metal monuments which were briefly fashionable in that era. We did a little research and found that almost all, if not all, zinc grave markers were made by the Monumental Bronze Company of Bridgeport, CT, between 1874 and 1914. It was cast in many pieces/panels and then assembled into the remarkable edifice you see here. Though we do often find simple zinc headstones, we have seen none up to its complexity, imagination and beauty. To find it nestled into this lovely setting of a country church in rural Georgia is remarkable, and quite a treat to find in such excellent condition. The zinc memorial is remarkable enough, but note that there are six plaques inserted that detail the life story of Mr. Hutcheson and his remarkable rise from a young Irish immigrant to the wealthiest man in the area. He was quite the entrepreneur, and a true example of the American dream.